The Law Offices of David A. 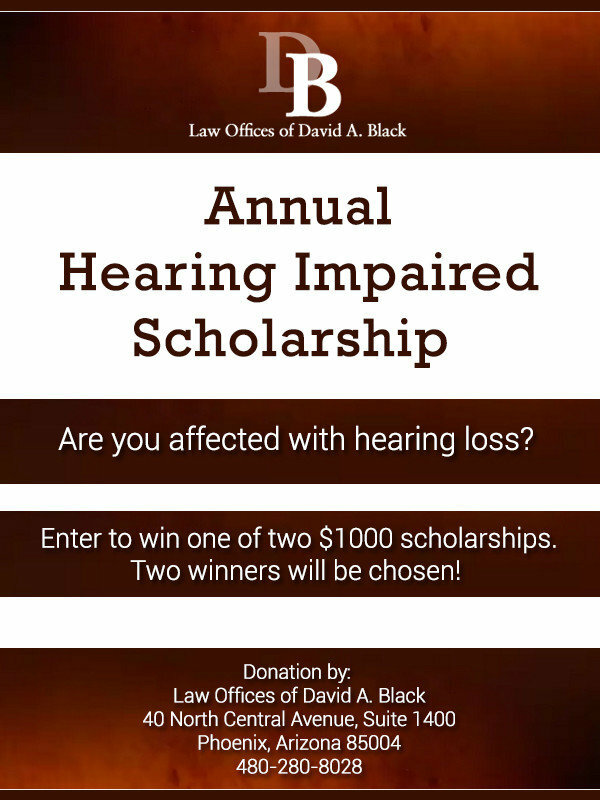 Black is pleased to announce that it is offering two $1,000 educational scholarships annually* for the Deaf and Hard of Hearing students. Hearing loss can have a negative effect on academic performance, and that effect can be profound. Typically, deaf students may experience difficulties with certain school subjects (for example grammar, spelling and vocabulary). They may also have problems taking notes, participating in class discussions, and making oral presentations, among other difficulties. These scholarships are intended to provide assistance that will allow hearing impaired students to continue their education. The scholarships, each in the amount of $1,000, will be awarded annually for secondary or post-secondary educational classes (secondary school, college, trade school, community college, etc.). You need not be currently enrolled in order to qualify. The winners will have one year from the date of their award to provide a tuition invoice from the educational institution, and the Law Offices of David A. Black will then issue a check payable to the institution in the sum of $1,000. Applicants must have a 40dB (or greater) bilateral hearing loss, and must be citizens of the United States. All required materials must be received no later than November 8, 2016. A short statement (no more than 100 words) explaining how you would benefit from the scholarship. (Optional/Recommended) An original essay of between 650 and 1,000 words explaining how your hearing loss has affected your education. Winners may be required to submit proof of hearing loss. Complete the application below, upload your statement, essay, and agree to the terms and conditions. Winners will be selected based upon the amount of online “activity” related to their submission. For example, if a submission is funny, inspirational, heartfelt, etc., it will often result in higher online appreciation of that submission. However, the final decision for the awarding of the scholarships will be the sole decision of David A. Black. Decisions will be made on or before December 7, 2016. The winners will be notified via email. You can see the entries here. *The Law Offices of David A. Black reserves the right to discontinue the scholarship program at the beginning of any calendar year.